"The Number 1 Online Wildlife Art Store." Online Shopping For Wildlife Art Lovers. Remember, all of our items come with a 30 day 100% money back guarantee*. 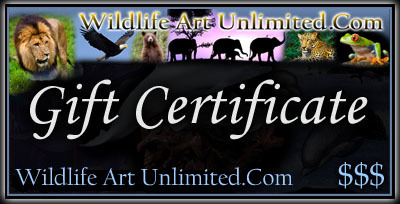 Thank you for shopping at Wildlife Art Unlimited! with affordable and beautiful Wildlife Art Gifts, Wildlife Art Sculptures, Wildlife Art Figurines, Wildlife Art Collectibles, Wildlife Art Statues, Wildlife Art Clocks, Wildlife Art Collectable Plates, Wildlife Art Candle Holders, Wildlife Art Picture Frames, Wildlife Art Art, Wildlife Art Afghans and more!! !